It’s February, the most romantic month of the year. What better way to profess your love than with an evening at the Opera? Operas are known for their passion, tugging at your emotions with heart-wrenching arias of tragic or unrequited love. Of course, sometimes love can be a just a tad extreme. One of our favorite Operas, Richard Strauss’s 1905 Salome, definitely takes the expression “falling head over heels” over someone to a dark place that’s guaranteed to thrill, shock, and entertain. When Salome first premiered, this steamy brew of eroticism and religion so unnerved audiences that it was banned in Vienna and London. The opera’s troubles didn’t end there. In 1907, at New York’s Metropolitan Opera, it was yanked from the company’s repertoire just days after its premiere. So why is this story so romantic, yet controversial? And why has it become one of the most successful and popular of all twentieth-century operas? Perhaps it’s the thematic mix of religious fervor, sexual fury, and necrophilia that audiences just can’t get enough of! In a nutshell, the plot of Salome boils down to a biblical Fatal Attraction (except without the rabbit). The beautiful Princess Salome, daughter of King Herod, has the hots for the imprisoned prophet Jochanaan (spoiler alert: he’s John the Baptist). But Jochanaan doesn’t want anything to do with her and spurns her affections. Meanwhile, when the spying Narraboth, who has a thing for Salome, hears her begging Jochanaan for a kiss, he seriously can’t deal and offs himself. Talk about the perils of unrequited love! Eventually, King Herod, who slips on the recently deceased Narraboth’s blood (somebody please call housekeeping), begins to hallucinate and lust for Salome himself (there must be something in the blood). But of course, Salome rejects him. However, when the King promises to grant Salome’s heart’s desire if she’ll dance for him, she sees her opportunity to get back at Jochanaan for blowing her off, and basically does a Striptease that blows Demi Moore’s out of the water. Her veiled attempt at vengeance works (see what we did there? ), and Salome demands Herod honor his promise by delivering Jochanaan’s head on a silver platter. She gets exactly what she ordered. But fortunately (or unfortunately, depending on your personal gross-out meter), instead of dining on the morbid dish, Salome professes her love for the decapitated head, caressing and kissing its dead lips. That’s just too much of a head-trip for Herod, who loses his lust (and probably his lunch) and orders Salome’s own life as the second course of this bloody banquet. 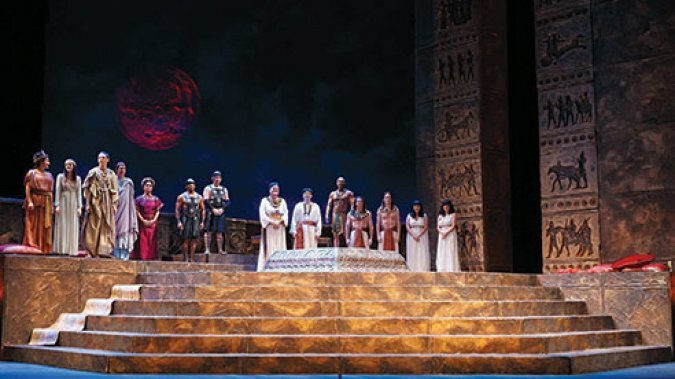 You can catch Florida Grand Opera’s lavish production of Salome now thru February 10th, at the Adrienne Arsht Center and Broward Center for the Performing arts. The Opera stars a high-voltage cast, including Melody Moore and Kirsten Chambers sharing the titular role.